Samsung announced the Galaxy S9 and S9+ in February, and it’s been just a month. Still, the company has already started working on the Galaxy Note 9, which is expected to arrive in August or September. With the model number SM-N960U, the phone showed up on Geekbench today that revealed a couple of specifications along with the Geekbench scores. Spoiler alert! There are no surprises. We saw last year that the Galaxy Note 8 wasn’t a very big upgrade from the Galaxy S8 and S8+ regarding the specifications. It had the same processor, almost same sized display, similar battery size ( a bit smaller than S8+) and the same RAM. Things that made it different from the S8+ included a not so curvy design, dual rear cameras, S-Pen etc. Samsung might try to add some more features to the Galaxy Note 9 this year, but some of the specifications are surely going to remain the same. 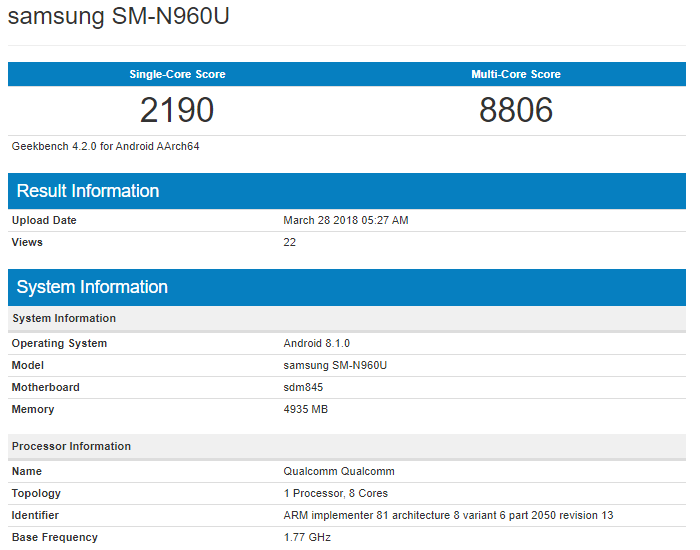 The Geekbench listing shows the same as the Note 9 is coming with Snapdragon 845 and 6GB RAM, which is similar to the Galaxy S9+. Android 8.1.0 Oreo runs out of the box. Talking about the scores, they are pretty similar to the Samsung Galaxy S9 and S9+, since the chipset is the same. The phone scored about 2200 on the single core and 8800 on multi-core. There are no details of the design and specifications yet so stay tuned.